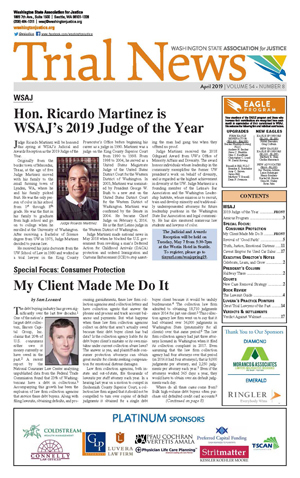 Trial News, WSAJ's monthly publication, is loaded with trial tips, feature articles and columns. It keeps members informed about recent verdicts, settlements, and new developments in the law. Our goal is to produce an informative, timely, and well-edited newspaper, which will help trial lawyers in their practices. Published eleven times a year, Trial News reaches our 2,400 members per month and another 400 judges and opinion makers in the legal community throughout the region. To place an ad in the Trial News contact Stephanie Haase at (253) 216-1256. View advertising rates here. EDITORIAL POLICY: Trial News is edited for members of the Washington State Association for Justice. Publishing and editorial decisions are based on the editors’ judgment of the quality of the writing, the timeliness of the article, and the potential interest to Trial News readers. On occasion, Trial News will publish articles dealing with controversial subjects. The views expressed in Trial News are those of the authors and may not reflect the official policy or position of WSAJ or Trial News. No endorsement of those views should be inferred unless specifically identified as the official policy of WSAJ.